Overlooking Baltimore’s scenic Inner Harbor, roughly 100 attorneys packed the 15th floor of the Downtown Hyatt Regency on September 28, 2018, for a one-of-a-kind opportunity to learn from leading general counsel on hot-button issues facing their field. 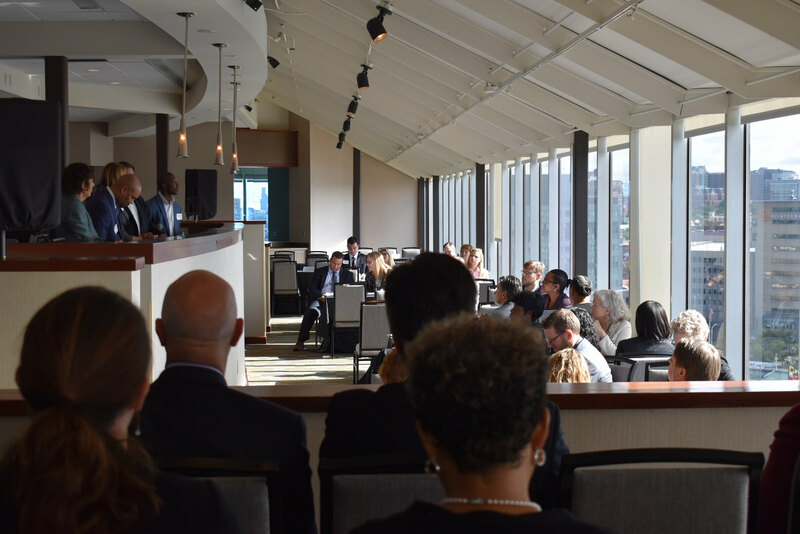 The MSBA teamed up with Judicial Events™ to present “2018 Legends of the Boardroom”, which featured a powerhouse of in-house counsel who spoke to the “In’s and Out’s of the Corporate M&A”, “Cyber Security and Compliance”, “International Arbitration”, and “A View from the ‘C’ Suite: What General Counsels Want You to Know About Billing!”. Other event sponsors included Womble Bond Dickinson; Goodell DeVries; Levy, Mann, Caplan & Hermann & Polashuk, LLP; Wright, Constable & Skeen, LLP; McGuireWoods; Fedder and Garten, Professional Association; Nemphos Braue; Legal Technology Solutions, LLC; Safe Harbor Discovery, LLC; and The Daily Record. The MSBA CLE Department helps lawyers to advance their practices and better serve their clients through a wide selection of CLE programs, delivered to you in a variety of ways, including live programs, online CLE, live webcasts, and MP3 downloads. MSBA also offers over 200 publications in the form of practice manuals, handbooks, program materials, forms on CD, and DVDs. MSBA CLE publications address more than twenty discrete areas of law practice, utilizing a volunteer corps of hundreds of experienced and respected practitioners, judges and professionals who unselfishly contribute their time and expertise to help Maryland lawyers improve their practice and professionalism. Visit the MSBA CLE Department online to learn more.